What would it be like for Minecraft to cross with Battlefield? Guncraft attempts to answer that question. It gives you the ability to not only participate in multiplayer matches in user-built maps, but create custom loadouts, structures, weapons, and skins. Saying this game is ambitious does not even begin to describe it, but that does not mean it is perfect. 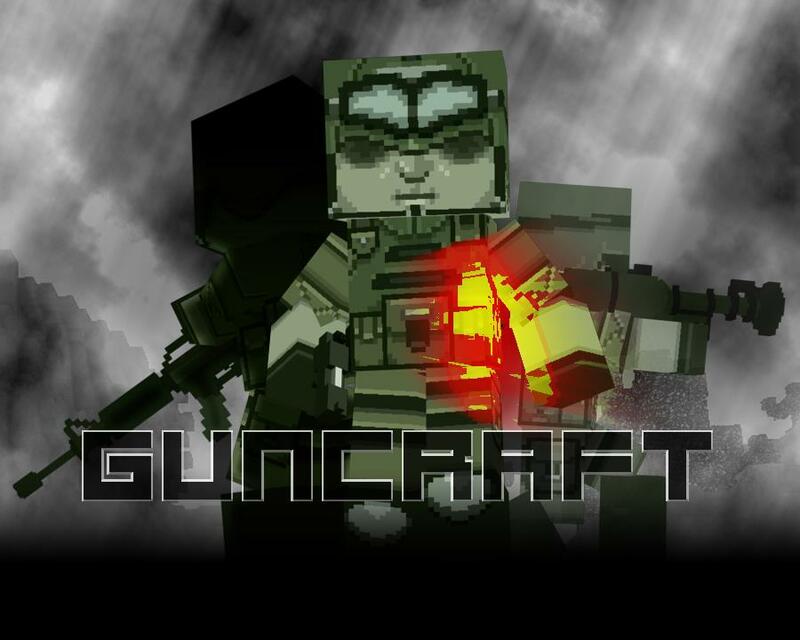 Guncraft lacks significant polish and outside sources are required to fully use the game. Multiplayer is the name of this game. With a huge amount modes such as deathmatch, races, and the Minecraft inspired spleef, there is a lot of variety to be found. When custom maps enter the experience you’ll never know what to expect next, from Star Wars inspired battlefields to maps that replicate classic Mario worlds, the only true limitation is the community’s imagination. Vehicles like tanks, land speeders, and helicopters are also available but it’s rare to see straight out vehicular combat in standard modes. Customizable loadouts are also available with a page taken out of Call of Duty. With 100% destruction on all maps, just about anything is possible. Combat seems flimsy and unbalanced, but it is hard to say that is a complete negative. There is no kick back to every weapon including more heavy ones like the rocket launchers, and speaking of rocket launchers, they come with 24 rounds with clips of four per load out. Despite the fairly evident balancing issues, this game is all about fun. It is not about precision or advanced tactics, it is about doing crazy, over-the-top kills while taking advantage of the fully destructible maps. Guncraft attempts to give the player as many tools for destruction they can. Technical polish is disappointing to say the least. The first day that this released on Steam, it was completely unplayable online, the only modes available was a map editor and LAN matches. After that issue was cleared up, another one continued to plagued the multiplayer. There are times that the servers are not displayed and if you are lucky to get into a match, there is a possibility that you will be instantly kicked. These are potentially game breaking bugs that will ruin a player experience quickly. For all of your customization needs, visit the Foundry. It is the space where all of your customization goes on, but you will need a lot more than just the Foundry to get everything out of what Guncraft offers. The map editor is comparable to Minecraft’s creative mode but there is also the ability to import custom voxel maps. There is a similar editor for items that can be placed inside multiplayer matches, but this is limited to the amount of blocks given based of multiplayer kills. Custom skins in Guncraft must be created completely outside of the game and need to be imported into the game. There are enough default skins to suffice, but this editor seems more like a mod importer than an actual feature. The same goes with the crosshairs on a customized weapon, they must be uploaded in the form of a .png file. Unfortunately, this aspect of Guncraft feels completely unfinished. Gunsmithing is both the most exciting and disappointing part of Guncraft. Guns can look like anything the player desires and with fully changeable statistics. However, it lacks polish and is seemingly unfinished. As mentioned before, it requires an external .png to be completed and the scaling on the guns has the potential of being off. There is no player model to compare it to while editing, so when testing the gun, It may be to large or small for actual use. In the end, these systems are completely usable but it requires a large amount of time outside the actual game in order to fully use. Guncraft is neither good nor bad, it is how you use it. There are a lot of interesting concepts that the game introduces and the scope of it is massive when comparing it to other indie titles. The problem is in execution, instead of defining the core gaming experience and cutting some of the additional meat from the game, they went for quantity in place of quality. The lack of other game types such as AI bot battles seems incredibly short sighted and this could have been implemented over some of the unfinished creation modes. The developers seem to have the dedication needed to fix and polish many of their shortcomings, but in its current state, Guncraft is an unfinished game with good intentions.